Fond Memories of Western Blot Film - Advansta Inc.
Back in the day (the good ‘ole 1990’s), things used to be so simple. When you wanted to develop your Western blot you would soak it in some chemiluminescent substrate then head to the dark room for some quality time by yourself with your Western blot film. What could be better? 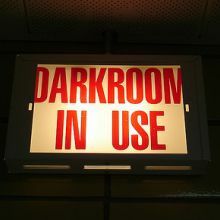 The dark room was great. Trying to figure out the difference between blue film and gray film – can you use both sides? It’s a shame that digital imaging might take all of this away. Don’t you agree? Photo courtesy of Stephen Cummings.